Here’s a fun and festive one for the Fourth of July!! 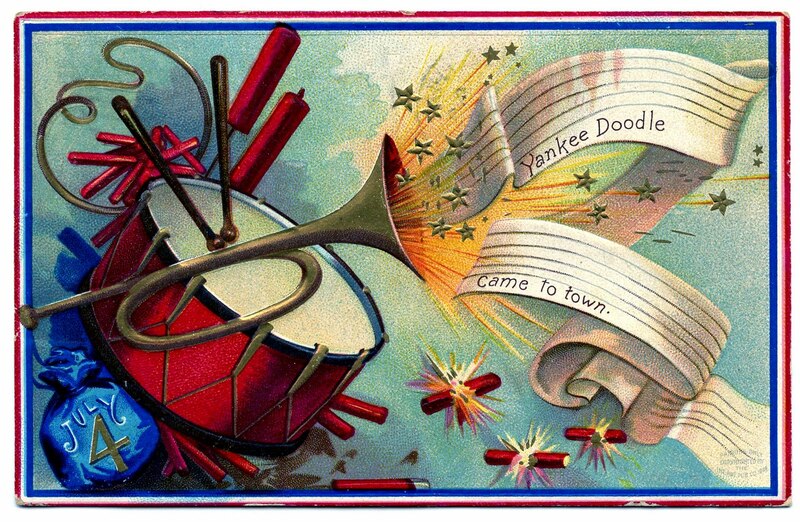 This one’s got it all, red white and blue, Firecrackers, a Drum and Horn, Stars and even Yankee Doodle music!! I think it would make a cute card or invitation! Fantastic Vintage French Corset Store Photo! 9 Cherubs and Hearts Images – Updated! Cute Vintage Patriotic Download! Hooray for the red white and blue!! Thanks for all you yankee doodle do, Karen!! OOOoooh, that’s a colorful one. I love it. Thanks! Thanks for your comments ladies!! Lovely! I’m going to use this for cards when I finally get my US citizenship! Love it! Very patriotic. Thank you. That’s awesome…I’ll have to come up with something to make with that…Thanks! Thank you so much for these July graphics. They are fantastic!! Hugs, Edna B.
this is particularly lovely. Thanks so much!